Tim Gard, Funniest Keynote Speaker Ever! Curious about Tim Gard’s presentations? The videos found on this page will give you direct insight into what you can expect when you book Tim Gard as your next keynote speaker or workshop facilitator. His message is universally understood and applicable to audiences of all types and sizes! Tim is an expert on using humor as a business skill. He inspires those who experience his presentations to learn how to ‘see the funny’ in times of stress, so as to maintain the ability to focus on the necessities of conflict and problem resolution. He will help your staff become stronger individuals in both the professional and personal lives, which ultimately then leads to stronger, more efficient teams and an enhanced culture of teamwork! Be Sure to Check Out Tim’s Blog & Newsletter! When you want to keep your finger on the pulse of all the latest and greatest in Tim’s tips and adventures, take a peek at his blog and please register for his newsletter: Chicken Feet for the Soul! There is no easier, nor more fun way, to incorporate humor into your skill set than by following Tim’s updates. He makes learning fun, while encouraging respect and consideration toward taking the serious things seriously, while shedding light on available options to avoid stress fatigue. The #1 Choice for Clean Humor in the Workplace! As a Member of the National Speakers Association‘s elite Speaker Hall of Fame, Tim Gard is a world renowned expert who consistently leaves a lasting, powerful and positive impression on your group. 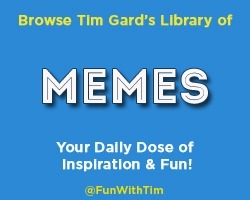 To keep the good vibrations ever-present, take a peek at Tim’s Shop to explore his inventions, books and training DVDs!